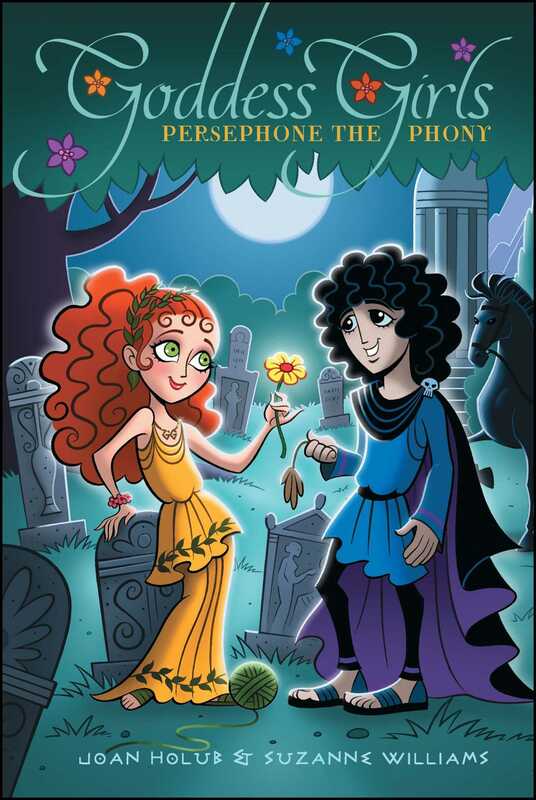 Persephone learns that it’s ok to stand up for herself in the second book in the Goddess Girls series! Persephone usually goes along with whatever everyone else wants instead of doing what makes her happy. So when she meets Mount Olympus Academy bad-boy Hades, she finally feels like she has found someone with whom she can be herself. But her mom (Ceres) and her friends don’t exactly approve. If Hades can make her feel so special, is he really that bad, or just misunderstood? A LYREBELL PINGED, SIGNALING THE end of another Monday at Mount Olympus Academy. Persephone crammed the textscroll she’d been reading into her scrollbag and got up to leave the library. As she joined the throng of godboys and goddessgirls streaming into the hallway, a herald appeared on the balcony above them. “The twenty-third day of the school year is now at an end,” he announced in a loud, important voice. Then he struck his lyrebell again with a little hammer. “Hi, Athena.” Persephone pointed to the pile of scrolls. “Some light reading?” she joked. “Research,” said Athena. She was the brainiest of Persephone’s friends, and also the youngest, though they were all in the same grade. The two goddessgirls continued past a golden fountain. Persephone’s eyes flickered over a painting on the wall beyond it, showing Helios, the sun god, mounting to the sky in his horse-drawn carriage. The academy was filled with paintings celebrating the exploits of the gods and goddesses. They were so inspiring! “Hey, you guys, wait up!” called a goddessgirl in a pale blue chiton—the flowing gown that was all the rage among goddesses and mortal Greek women right now. Aphrodite, the most gorgeous of Persephone’s friends, raced toward the two girls across gleaming marble tiles. Her long golden hair, held in place by seashell clips, streamed behind her as she dodged past a godboy who was part goat. He bleated, but when he saw who it was, he stared after her with an admiring, doe-eyed look. “Well,” said Athena, “I could use some new knitting supplies.” Athena was always knitting something. Her last project was a striped woolen cap. She’d made it for Mr. Cyclops, the Hero-ology teacher, to cover his bald head. “You’ll come too, right, Persephone?” Aphrodite asked. “Let’s stop by my room first,” said Aphrodite. “I need to change.” Aphrodite was obsessed with clothes and had a different outfit for almost every activity, often changing five or six times a day. The student dorms were upstairs: girls on the fourth floor and boys on the fifth. Taking the steps two at a time, the goddessgirls were soon at the entrance to the fourth floor. “I’ll drop these scrolls in my room and be right there,” said Athena. Aphrodite and Persephone continued down the hall nine more doors. After flinging her bag onto Aphrodite’s bed, Persephone perched on the edge of it. “I’ll just be a minute,” Aphrodite said as she opened her closet. Persephone glanced around the room. It was small, but intended for two, with an identical bed, desk, and closet on each side. Aphrodite and Artemis were supposed to have been roommates, but Aphrodite had objected to sharing space with Artemis’s three smelly dogs, so Artemis had moved into the room next door. Persephone would’ve loved to live in the dorm, but her mom insisted that she live at home instead. Within minutes Aphrodite had wriggled into a fresh chiton—a lavender one this time—and Athena had returned. Back at the entrance to the hall again, the three goddessgirls shucked off their shoes and grabbed winged sandals from a communal basket. As soon as they slipped them on, the sandals’ straps twined around their ankles, and silver wings at their heels began to flap. In a blur of speed, they raced down the marble staircase to the main floor of the academy. Then, with their feet barely touching the ground, they zipped out the heavy bronze doors and sped across the courtyard. The wind whistled in their ears as they whipped past boulders and trees while descending Mount Olympus. The Immortal Marketplace stood halfway between the heavens and Earth, below the cloud line. The goddessgirls reached it in minutes, skidding to a stop at the entrance. Loosening the straps around their ankles, they looped them around the silver wings to hold them in place so they could walk at a normal speed. The marketplace was enormous, with a high-ceilinged crystal roof. Rows and rows of columns separated the various shops selling everything from the newest Greek fashions to tridents and thunderbolts. Persephone followed Aphrodite and Athena into a shop that sold makeup. There weren’t any clerks, so Aphrodite went directly to one of the counters. A sculpted bust of a beautiful goddess sat on its glass top, surrounded by bottles and boxes of eye powders and liner, creams, and blushes. “Could you make us look like Egyptian princesses?” she asked the statue. “It would be my pleasure to do so. Please be seated,” the statue replied in a polite voice. Almost immediately, three of the boxes opened and brushes flew out, ready to begin powdering the girls’ faces. Her makeup brush paused, almost as if in shock. Drooping with disappointment, the little brush returned to its box as Aphrodite’s brush began dusting sparkly blue powder on her eyelids. Persephone obeyed, and the brush immediately began dusting blue on her eyelids as well. When the goddessgirls finally left the shop, Aphrodite’s and Persephone’s eyes were heavily lined with black kohl, and Persephone carried a bagful of lipsticks, eyeliners, and eye powders that she didn’t really want. Oh well, she thought, she’d leave them in the Beautyology classroom later. She could hardly wait to wipe off the kohl from around her eyes when she got home. Against her already super-pale skin, the heavy black eyeliner made her look positively pasty. On Aphrodite, of course, the kohl looked great, but it made Persephone feel like a raccoon. “Look!” Athena exclaimed. “There’s Arachne’s Sewing Supplies.” The goddessgirls hurried over to the shop. Athena and Aphrodite oohed and aahed over bins of shimmery fabrics and colorful threads and yarns. “Yeah!” Persephone pretended to be excited too, but in truth she was bored. Besides, she didn’t plan to go to the Harvest Hop. Even if she had wanted to go, she doubted her mom would let her. She thought Persephone was too young for dances—for any activity involving godboys, actually. Her mom owned a shop in the mall, Demeter’s Daisies, Daffodils, and Floral Delights. Persephone would have enjoyed stopping by to see the new fall bouquets, but she didn’t suggest it. She knew Athena and Aphrodite didn’t share her interest in gardening. “You should take up knitting, Persephone,” said Athena. She held a big ball of luminescent green yarn next to Persephone’s head. “What do you think?” she asked Aphrodite. “I was asking about the color of the yarn next to her hair,” interrupted Athena. Leaping Olympians! thought Persephone, stunned. They were talking about her as if she wasn’t even there! But she continued to stand between them as they tossed remarks about her back and forth over her head. “But I—,” Persephone started to protest. Persephone sighed. She didn’t want a cap. She never wore caps. Besides, despite having a green thumb for gardening, she was all thumbs at sewing and knitting. But faking an enthusiasm she didn’t feel, she bought the yarn anyway, planning to return it next time she visited the market. “Thanks,” she told the saleslady in a cheerless voice. “I can’t wait to use this.” Her words sounded so false. Couldn’t anyone else see what a phony she was? Even the sound of her name seemed to show it: PersePHONY. But she lacked the guts to say how she really felt about even the smallest things. “Don’t let me forget to give you that pattern later,” Athena said as the goddessgirls left the mall. Persephone nodded. “Sure,” she said, though she rather hoped Athena would forget. Waving, Athena and Aphrodite barely slowed as they ascended to the top of Mount Olympus without her. Persephone watched them wistfully. Among her friends, she was the only one who lived at home, instead of in the dorm. Veering right, she came across a stream and washed off her eye makeup. Then, as she began to zip upward again, the papyrus bag holding her purchases ripped. The ball of yarn rolled out. She made a grab for it, but only just managed to catch the end of the string as the ball tumbled toward Earth, unwinding as it fell. “Come back here, you snarly little ball of trouble!” Persephone grumbled.